Internet monitoring firm DeepField said Apple used its own content delivery infrastructure to handle "a significant portion" of iOS 8 traffic yesterday, marking the first time the company tapped its CDN for a large-scale rollout, The Wall Street Journal reports. Prior to the release of iOS 8, Apple turned to third-party CDNs like Akamai for massive distribution jobs, but it seems the company is looking to move responsibility to its own servers. DeepField pointed out that Akamai managed some of Apple's iOS 8 traffic, but Apple's own system took on most of the heavy lifting, causing traffic to spike 10 to 20 times normal levels on most networks. "It really was a significant coming out party for the Apple CDN," said DeepField CEO Craig Labovitz. "This is definitely a realization that Apple is not just a software player. They're not just a maker of PCs. They have an Internet backbone and an international Internet presence." 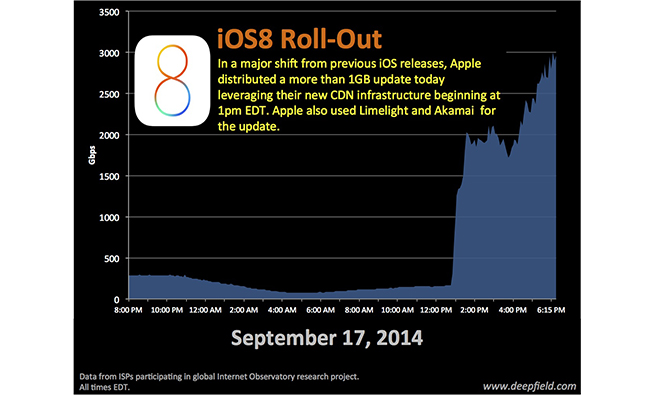 According to DeepField's analysis, at its peak, iOS 8 downloads ate up more than three terabits of bandwidth per second. It was reported that Apple had activated its CDN in July, but tasked the system to handle only a small portion of overall traffic. At the time, it was said that Akamai and Level3 would continue to serve iTunes and iTunes radio.